We all know that pacifists, socialists, and flag-burners would advise you never to join the U.S. military, ever. Forget that for a moment. Even if you consider yourself a good patriot, do not join the U.S. military now. Right this moment, I don’t wish to have the huge, overarching, “Is Joining the U.S. Military a Heroic Act of Public Service or a Dastardly Scheme to Press Poor People Into the Service of Imperialism” argument. (There will be plenty of time for that in years to come, or feel free to look up various iterations of it from our parents and grandparents’ generations.) Let us stipulate that the question of the fundamental rightness or wrongness of the existence and historical use of a powerful, global U.S. military is a question that we may not fully solve in the course of this blog post. There are many people who, for political reasons, would never consider joining the U.S. military in the first place, barring some WWII-level catastrophic need; there are others who consider joining the military to be a patriotic duty and have a deep contempt for those they see as shirking that duty. Fine. For the purposes of this discussion we can set aside those who had no inclination to join the military in the first place. There are lots of reasons why people do join the military. Some join because of their own deeply held political beliefs; some join from a vague sense of patriotism; some join seeking discipline, or adventure; some join because they think the TV ads are cool; and some join just because it is one of the few steady and reliable jobs open to all comers. Few, I believe, join the U.S. military for the purpose of perpetuating injustice at home and abroad. Few join hoping to kill or be killed in a war that never really needed to happen. Few join with the hopes of sacrificing their own bodies and souls for the sake of a few very rich men with very bad ideas. 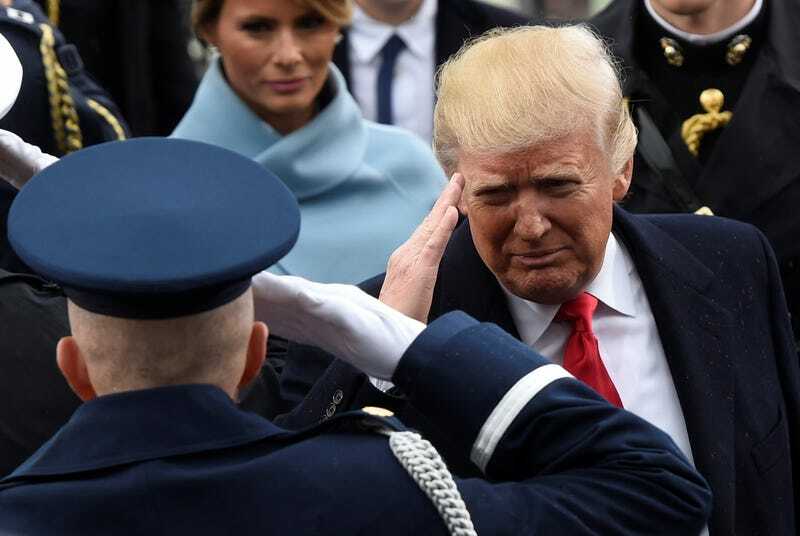 By joining the military, you place yourself at the service of the U.S. president. That’s the deal. You agree that, if ordered, you will go out and kill people you have never met, and risk being killed yourself. You do not get a say in these decisions. You do not get to examine the facts and decide whether the violence you are being asked to perpetrate or support is right or wrong. When you join, you have already made that decision: whatever your commander in chief decides that you should do, you will do, up to and including killing and dying. We often speak of military service being performed “for your country,” but it is more accurate to say it is being performed for the president’s wishes. When and where the president decides it is time for you to go, you go. Now, look at the president we have today. Think about him. Not about whether or not you voted for him, or whether you like or dislike his political opponents. Think about him, and his personality, and the way he talks, and the way he acts, and the way he operates. I will try to describe him in ways that I think everyone can agree on: He is extremely reactive to criticism. He tends to lash out at those he sees as enemies. He does not care a great deal about the norms governing how a president is expected to act, which have been developed over long periods of time. He is belligerent. He is not afraid to challenge or insult foreign nations and adversaries of all sorts, regardless of diplomatic concerns. He is unconcerned with nuance. And he is unpredictable. Yes, very unpredictable. An aggressive, belligerent, unpredictable man, sensitive to criticism, unafraid of consequences, operating with great power in a dangerous and complicated world. This man is now the commander in chief of the U.S. military. This is the man that you will hold your life in his hands when you join the armed services. Perhaps you agreed with the things that Donald Trump said during the campaign, and for that reason you feel confident in serving under him. But how confident do you feel that you know what he will do over the course of four long years? Here are two things that I think we are equally likely to be saying around here four years from now: “Haha, I can’t believe how insane everybody got worrying about what this clown would do, when it turns out he was too incompetent and petty to get anything accomplished,” OR “We are now entering another devastating year of World War Three.” My point is that the range of plausible outcomes for the Trump presidency is so large that things that once seemed absurdly unlikely are now legitimate possibilities. Here is another thing that is now a realistic possibility: The courts rule against various Trump executive orders or decisions. Outraged, the White House announces it will defy the courts. The rest of the U.S. government must then choose sides. Alternately, you could see open defiance of Trump orders by civil servants throughout the government, leading to the same outcome. This is how civil wars begin. If something like this were to happen, Trump would order the military to enforce his will. The military itself would then have to choose sides. If you are a member of the military, you could put yourself in the position of being ordered to fight against American civilians in order to maintain a president’s power. A year ago, I would have dismissed this scenario as improbable bordering on impossible. Now—having witnessed Trump’s victory, and the team of advisors he has surrounded himself with, and what he has done thus far in office, and how the political opposition has reacted, and the global surge of nationalism we are living through—it would be dishonest not to consider such a thing as possible. Can we predict that it will happen? No. But then again, we can’t really predict much at all. Even barring such extreme outcomes, the risk of some sort of war beginning not due to necessity but due instead to ego-fueled escalation is higher than it has been in some time. If you want to help America right now, help Americans. Volunteer in your community. Feed the hungry. House the homeless. Tutor a kid. Coach Little League. Build houses for Habitat for Humanity. Give money to good causes. Take care of your family. Take care of the needy. Even if you would consider the military to be a noble choice in normal times, recognize that we are not living in normal times. There is no shortage of honorable things you can do for the world today. Don’t put yourself in the service of someone who might let you down.